A charming seaside town on the Algarve coast in southern Portugal, Praia d’Oura is speckled with quiet bars and excellent restaurants serving fresh seafood, all of which can be enjoyed overlooking the sea. A mere 20-minute walk from the old town of Albufeira, Praia d’Oura is the place for you if you are looking for a timeless beach experience where the peace is resounding and vibe of the place, extremely laidback. The beach itself is long and wide, the azure waters receding and advancing slowly, with low tide around noon. Praia dos Olhos A’gua, which hosts its annual four-day sardine festival in early August, and Fisherman’s Beach in Albufeira are also very close by from here so why not dedicate an entire day to exploring your very own seashore paradise? At all the beaches, a pair of sunbeds and an umbrella cost about EUR 15. 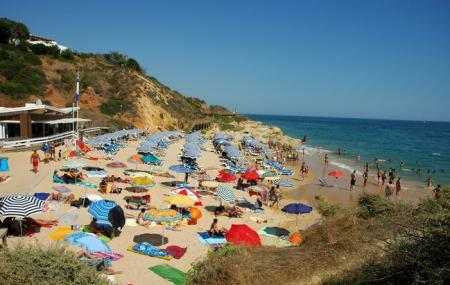 The beach is a 20-minute walk from Albufeira. How popular is Praia Do Oura? People normally club together Montechoro Strip and Praia Da Falesia while planning their visit to Praia Do Oura.